It may have nailed a record lap at the Nürburgring, but what does the Range Rover Sport SVR have to offer against the Mercedes-Benz ML 63 AMG and the Jeep Grand Cherokee SRT. A snippet from a recent conversation with crankandpiston.com colleague Bassam, and looking at our line-up today, you can see his point: there’s scarcely a wheel arch or front grille that hasn’t been flared or chromed. In place of the Range Rover’s fog lights, on the brand new Sport SVR we find enormous additional air intakes, and that’s atop the rather garish Estoril Blue paint finish. 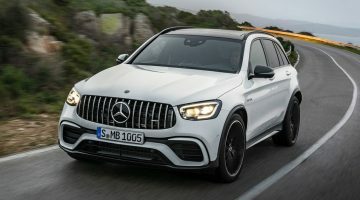 With the Mercedes ML 63 AMG, as well as hulking bonnet lines, 20in double-spoke alloys and chromed quad-exhaust tailpipes, you’ll also find an ‘AMG’ badge wherever there’s room for all three letters. Forget subtly curved bodylines and veneer wood panelling. Everything about our trio today is big, brash and intimidating to behold, a mark of the ferocity lingering within. And then there’s the power, of which there’s a stack load: combined our three muscle-hewn SUVs produce a whopping 1528bhp, akin to three Ferrari F50s. Take the newest member of our brood for instance – the Range Rover Sport SVR – which under the bonnet boasts a 5-litre supercharged V8. It’s essentially the same unit found in both the Sport on which the SVR is based and the volcanic F-TYPE V8 R from sister company Jaguar. Now with a revised supercharger for maximum boost, the SVR chucks out 542bhp and 501lb ft of torque, some 39bhp and 41lb ft respectively over its Sport underpinnings. If yet further perspective were required, this – the first Land Rover to wear the ‘SVR’ badge – offers the same power as a Jaguar XJ220, and last year lapped the Nürburgring in a scarcely credible 8m 14s. It is, we can all agree, pretty damn quick. It’s a similar situation we find with the ML 63 AMG. 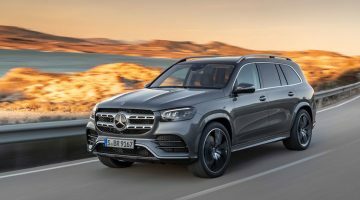 Although Mercedes has downsized the naturally aspirated 6.2-litre V8 in favour of a 5.5-litre biturbo V8 for the third generation, the ML 63 hardly lacks for straight-line grunt. Thanks to spray-guided direct petrol injection and two stonking turbochargers, the V8 produces 518bhp and 516lb ft, and is thus capable of hitting 0-100kph in just 4.8 seconds, barely a tenth slower than the SVR. In the ever-more competitive super-SUV horserace, these are some big numbers we’re dealing with. Which brings us to our final contender, the new-for-2015 Jeep Grand Cherokee SRT. Though perhaps not as blingtastic as its rivals here today (one could argue it’s the most elegant of our trio), the Jeep boasts a beefed up bonnet, slick, aggressively cut headlights, and aptly named ‘Goliath’ 20in alloys, ticking the ‘muscle SUV’ boxes as a result: the fact that it comes in considerably cheaper should not be forgotten either. 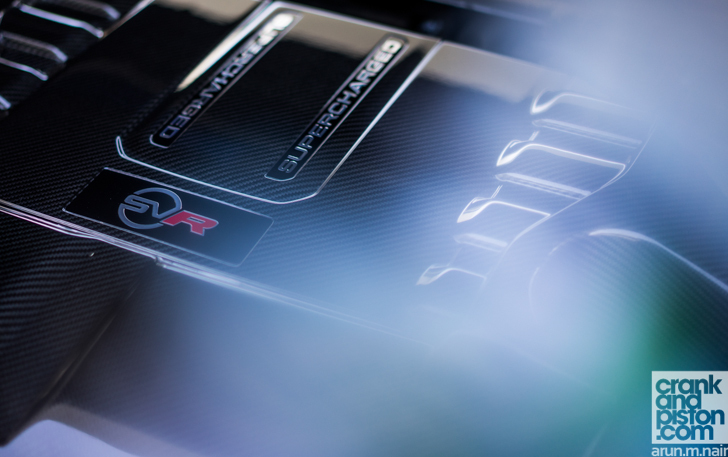 Boasting ‘only’ 468bhp and 470lb ft of torque however means the SRT trails both the Range Rover and the Mercedes to 100kph, and will ‘only’ hit 256kph whilst its rivals romp away to 260kph and 280kph respectively. From a top trumps perspective at least, the SRT is very much today’s underdog. That however would be forgetting the Street and Racing Technology treatment, which includes a more performance-focused Selec-Track stability system that sends greater torque to the rear wheels for improved traction, and revised ratios for the eight-speed transmission for faster (read ‘more aggressive’) shift changes. Performance credentials the Jeep demonstrates from the get-go. It may be the least powerful of the three but ye Gods this thing can shift, 468bhp being delivered with all the subtlety of a wrecking ball. There’s little in the way of subtle or linear power delivery, 70 per cent of the torque being sent to the Jeep’s rear wheels for what feels like instant oomph. Handy then that those enormous Brembos can bring the SRT to a dead halt from 100kph in just 35m. Swift changes through the paddle shifters allow the V8 to stretch its legs, though fortunately multi-adaptive seating means I don’t have to unduly stretch mine. Even at these monstrous turns of speed, good head and legroom in the cabin and improved noise cancelling in this refreshed model lead to a surprisingly civilised ride quality. Not that it’s quite enough to deaden that superb Hemi soundtrack. Even at idle and through those exhaust pipes, there’s a deep, throaty rumble of intent. Raise the revs in pursuit of that 5sec 0-100kph time and said rumble suddenly explodes into a thunderously loud roar, a soundtrack Jeep SRTs have been good at producing. It’s easily the SRT’s party piece. 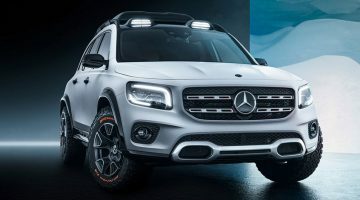 Like the Jeep, acceleration in the Mercedes offers a proper V8 thump, combined with a low, angry rumble that ricochets about the cabin, despite some very impressive sound deadening. And though the resulting performance is brutal, it’s not as heart-stoppingly aggressive – nor anywhere near as evocative – as the Jeep, despite the Mercedes getting impressively into its stride as the speed rises. This sense of barely contained ferocity is equally as demonstrable in the Range Rover when we pull over and swaps seats, although ironically the most powerful of our trio is far from the most barbaric under heavy acceleration. It’s boisterous and insistent certainly, but not aggressive. The Jeep’s pulverising turns of speed had left me wide-eyed and close to maniacal laughter, and while the noise emanating from the Range Rover’s exhaust pipes is glorious (particularly with the Sport Exhaust button pushed to open those lungs a little further), it doesn’t quite provide the thrill offered by the Jeep, even despite the fact it could easily trouble the straight-line performance of a Porsche 911. Saying that, the effectiveness of that mighty torque means pull is constant and unyielding, that monstrous supercharged V8 seemingly incapable of running out of puff. On the straights, I cast my eye down at the speedometer as the white and black blurs in my rear view mirror are left even further behind. The numbers fall effortlessly. It’s incredible. It’s an exercise aided immensely by the gearbox, changes crisp and rapid but also – somehow – remarkably smooth: shifts barely register at pace when I slip back into full automatic, and when I finally take another look at the speeds we’re hitting, I’m aware just how hard I’ll have to work the brakes. If drag-racing between the lights then were our only focus today, the Jeep would already have taken the winner’s garland. As our test route slips off the long straightaways and into the mountainous curves, the SRT’s performance does start to slip compared with its rivals. It just doesn’t quite boast the same agility and poise. For an SUV it’s remarkably light, but still the weight-transfer as 2336kg sloshes from side-to-side through the tighter switchbacks is a little unsettling, and I feel less inclined to unleash that raw power as adamantly as I did earlier. Changes through the gearbox, though sprightly, are also not as crisp as I’d like from something proudly carrying (multiple) ‘SRT’ badges. Indeed, the paddles themselves, which are mounted to the wheel but shorn off halfway down, prove a little cumbersome to use. Fortunately, those stellar brakes and some mightily weighted steering – feedback from which is astonishingly accurate – help neuter these potential pratfalls. No question, on these roads and with a more tangible sense of weight transfer to counter, the Jeep is playing catch-up to both the Mercedes and the Range Rover.